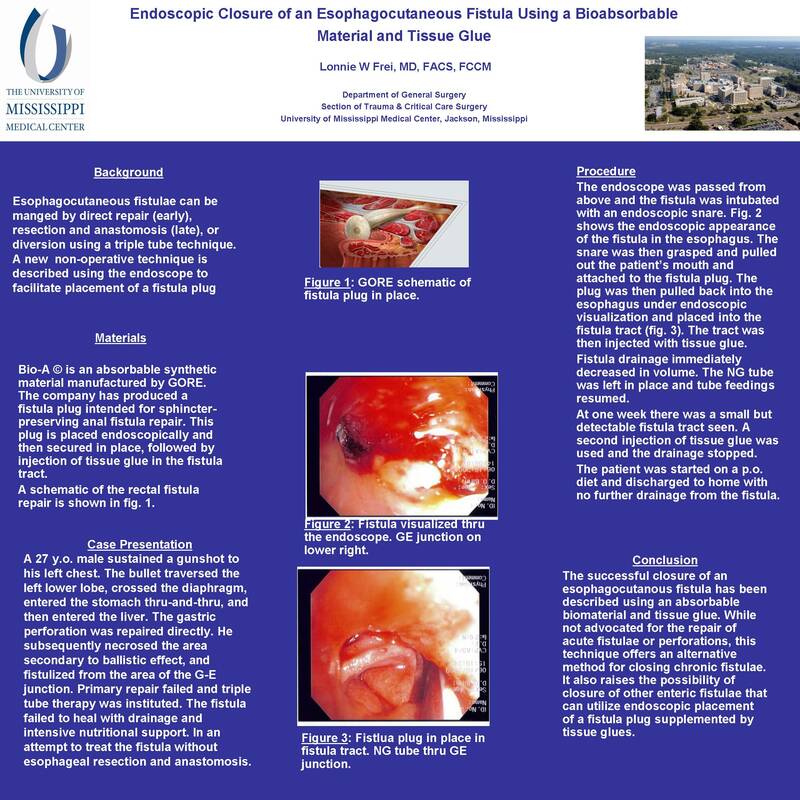 Objective: Non-operative closure of a chronic esophagocutaneous fistula whichwas unresponsive to othermodalities utilizing endoscopy for placementofbioabsorble material(Bio-A) buffered by tissue sealant. Methods: The fistula had been demonstrated on barium studies, and he had failed diversion as well as lesser operative attempts at closure. The fistula was cannulated, and under endoscopic control a grasper was passed through the fistula and brought out the mouth. The grasper then pulled a tissue plug made from Bio-A through the tract, partially occluding the tract. The tract was then injected with fibrin tissue sealant. Results: Fistula drainage immediately decreased in volume; a follow-up barium swallow showed persistence of the fistula at one week. A second injection of sealant allowed complete closure of the fistula by two weeks. The patient is eating normally with no fistula demonstrated by radiographic studies. He is gaining weight and was able to be discharged from the hospital after prolonged attempts at conservative management of the fistula prior to this procedure. Conclusions: The method presented was able to allow closure of a chronic traumatic esophagocutaneous fistula after conservative methods (exclusion/G-tube insertion/enteral nutrition) failed. This method was an attempt to close the fistula before major surgical intervention which would have included gastroesophageal resection and anastomosis. This method is not advocated for all esophagocutaneous fistulae, but was able to be used here in the setting of a complicated chronic fistula which had occurred late in the setting of thoracic and upper gastrointestinal trauma. It would be advocated as an alternative to failed conservative treatment of esophageal fistula (which includes esophageal diversion, G- and J-tubes and nutritional support) or to major operative treatment that includes resection and anastomosis. Its use would not prevent later resective therapy if unsuccessful. In the setting of acute esophageal injury standard surgical therapy is advocated.